Many educational facilities struggle with the lack of usable space available within their grounds, especially when it comes to the classroom. And school’s available space, or lack of it, can unfortunately limit the range of activities available for pupils in their classes, that could otherwise take place. Short of rebuilding the entire school – there is one easy solution. For both pupils and teachers, moveable walls and partitions can help enhance the potential of classrooms, by allowing staff to divide the space up into separate areas for different activities and groups, creating private and separate spaces. Moveable walls also allow classrooms to adapt to different class sizes. For smaller classes, they will allow you to have a smaller and more intimate classroom environment, so everyone’s voices are heard and not lost in empty, unused space. For larger classes, it can foster more activities taking place at the same time. They can also be used even more practically, whether to separate a cloakroom from the rest of the classroom, or by having somewhere to display pupils’ artwork as it dries, for them to take home at the end of the day. Or perhaps the partitioned space can act as a “breakout” area when pupils need space away from the rest of the class for various reasons. Many teachers struggle with their classrooms with having a lack of useable space for day-to-day classroom activities, or when it comes to a parent-teacher event, or even during exam time. Moveable walls can help offer an easy solution to break the classroom up to allow smaller, multiple classroom activities, discussions and functions. But outside of the classroom, moveable walls can also help with other areas of the school, such as the school hall, for exams, and functions in bigger spaces, such as parent’s evenings, open days and other school events. They can section off parts of a bigger space for more private conversations, or to separate different functions. 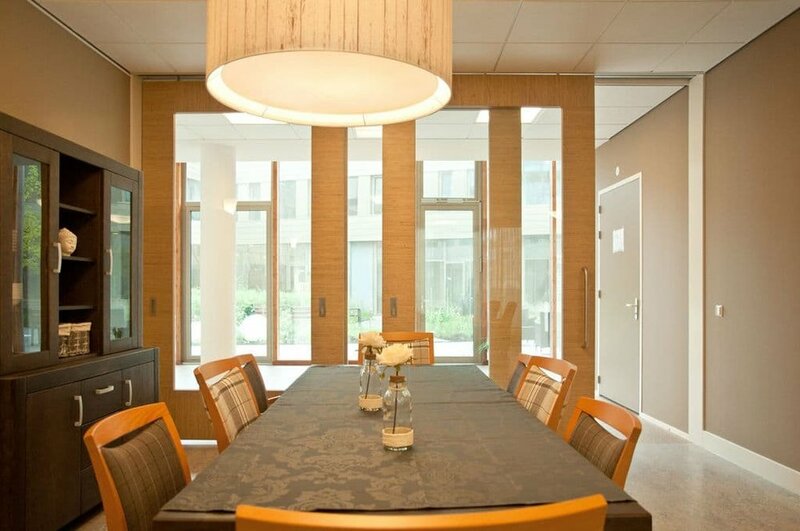 Moveable walls also bring with them varying levels of sound reduction. The type of partition you choose will vary on the particular needs, such as whether you want a wall that’s there on a more permanent basis, or is easy to open and close throughout the day, depending on the class and lesson plan. London Wall Design are proud to have partnered with Main Contractors - Morgan Sindall on these projects and continue to deliver superior products to Schools around the country. 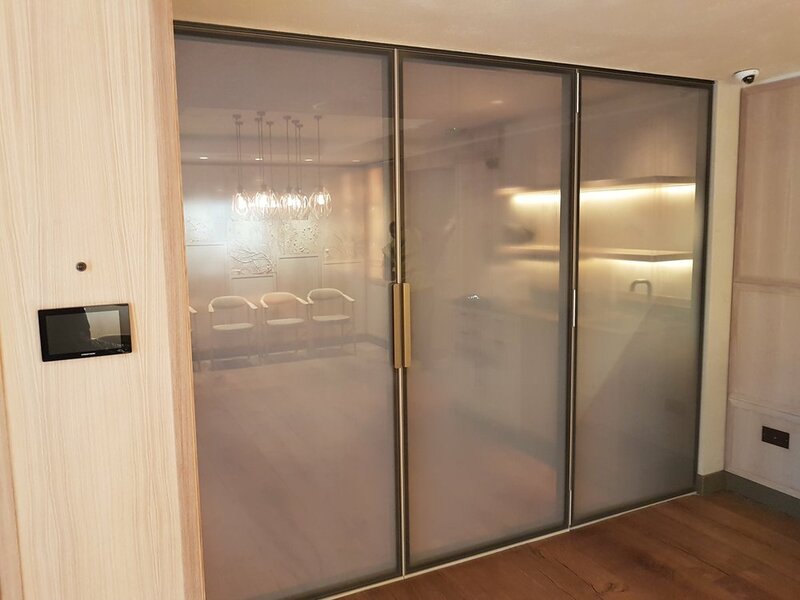 The latest installation just completed by London Wall Installation was a product developed by design to suit a specific requirement. One of London’s top fine dining establishments had a need to divide a private dining area into two smaller private dinning areas while allowing them to still maximise the space and keep the ‘Michelin Star’ aesthetics. 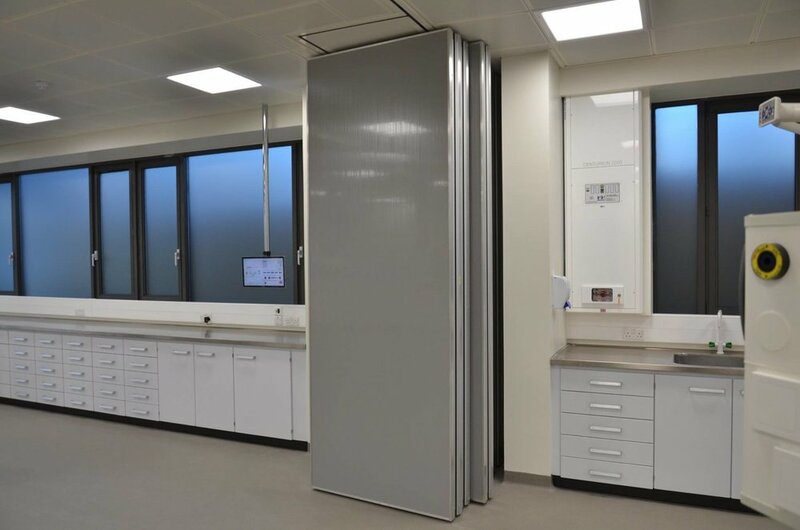 We used our latest G200 acoustic folding system in combination with our Top Hung Type 100 and tailored it to include static glass panels and full height glass access doors allowing us to maintain the Rw 47dB offered by the G200. 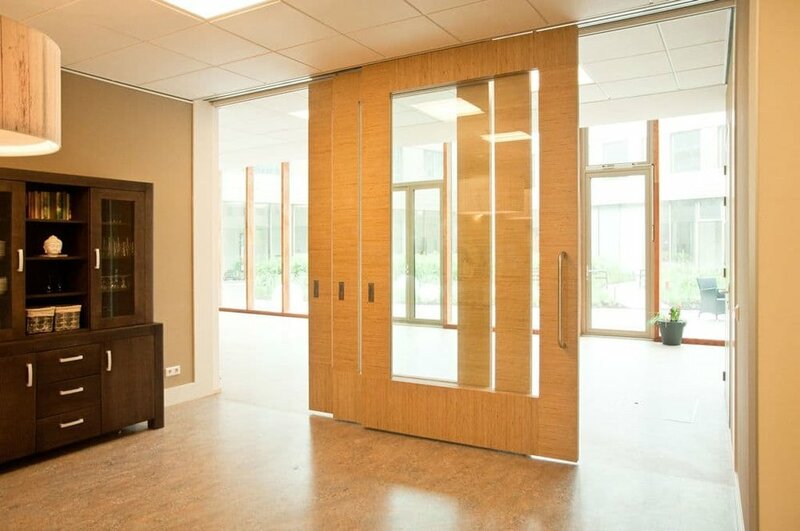 The double glass doors were essential to allow the staff to enter the dining area easily with their trolleys and the wood panel finish in keeping with the interior décor. Here at London Wall, we pride ourselves in being flexible and open to new ideas and designs. 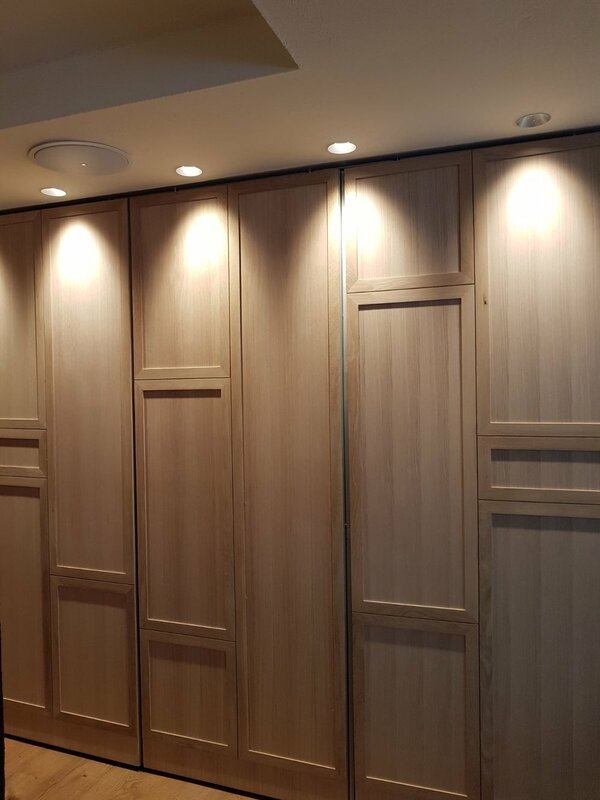 If you have a requirement that needs a personal touch or a bespoke tailored solution, give us a call and set up a meeting with our team who will be happy to guide you in the design of your master piece. 5 Reasons why you may need a movable wall. Our movable walls are designed to be multifunctional, making it easier for you to maximise or minimise space, as and when you need to. London Wall supply movable walls to evolve space, allowing you to get the most out of your office space. Movable walls come in a variety of materials with plenty of options to improve functionality, such as writable surfaces, tackable walls, and technology compatibility. As well as this, our movable walls can come in extremely handy for meeting rooms, ensuring that they are suitable for confidential meetings and practical for conferences. There is no set purpose for the movable walls that we provide; they are designed to make a smooth, stylish, ergonomic addition to any working environment. Movable walls are a great option for the prevention of noise pollution within your office, diminishing disruption and distraction. They have the ability to divide any room, making it more practical and also preventing sounds from travelling across the room. Understandably, you want to make your room more sophisticated and contemporary. Our products are designed to look permanent and to suit any environment. Additionally, they are all designed to blend seamlessly, paying special attention to design. Our walls will enable you to boost the aesthetics of your office, creating a more professional environment for your employees to work and for students to learn. The movable walls are designed to be flexible, suiting the requirements of any space, however, they incorporate a discrete design. Our industry leading products are exactly what you need if you’re looking for a solution for making the most of the space you have available. 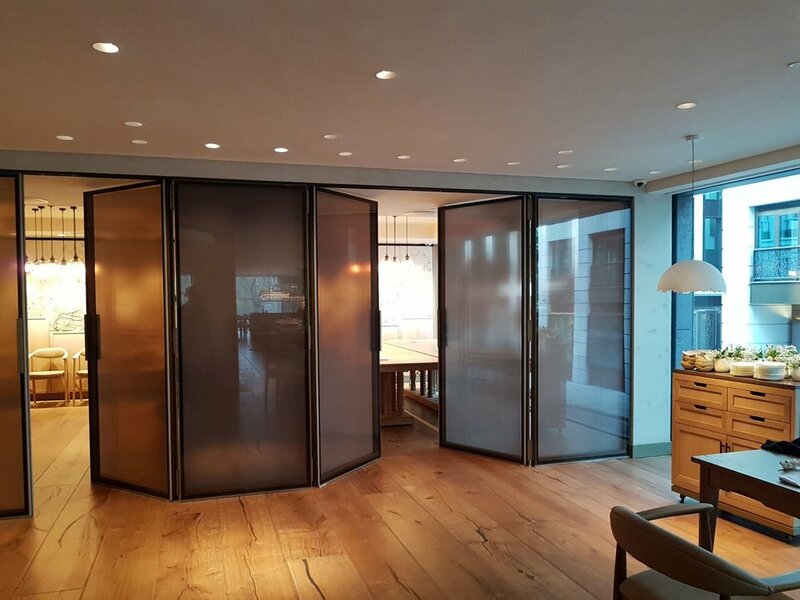 Using one of the movable walls from London Wall, you can easily open up an area, creating an illusion for additional space, however, you can also divide a room up into sections, making it more convenient for concentrating. Looking after our environment, making sure we source all of our timber products from FSC Certified suppliers, and re-using and recycling our packaging is high on our list of priorities. Over the last few years we have implemented new policies and procedures within the business to make sure we are “doing the right thing” to preserve our environment for the future. That’s why London Wall Design, led by Ron Gray recently underwent a two-day Head office and on-site audit of our Environmental Management Systems. We are very proud and pleased about all the hard work that Ron has put in, making these changes in-order for us to be awarded our latest certificate which is valid for the next 3 years. We will continue to strive as a Company to conduct our business activities in a responsible manner and minimise our impact on the environment, and to ensure that we comply with relevant environmental legislation as a minimum level of performance, including the requirements established under its certification to ISO 4001:2015 Environmental Management System. Our aim is to protect the environment through the appropriate prevention of pollution, and to reducing our environmental impact both on a strategic level and on a day to day basis. 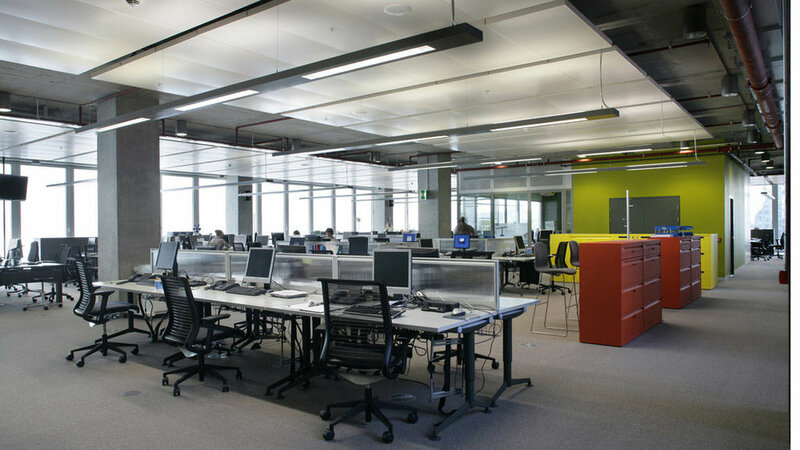 Effective use of lighting can have a very big impact on the spaciousness and comfort of an office. If you have many poorly lit areas in the office, it can create a sense of enclosure that will demotivate staff and make the whole office seem less vibrant. Natural light is the best, so try and utilise windows as much as possible but clean white LED light can also give the sense of more space. If you run a busy office that is always full of staff carrying out different meetings and conferences, it can be hard to find suitable space if your office layout is linear. Utilising bespoke structures can help you create unique spaces that are specific to your daily needs. When designing your office layout, it’s important to think about the day-to-day routine and plan things around that. It may seem like you are saving space by pushing a lot of desks or furniture to the back of the room but creating a free-flowing office layout that takes into account high-traffic work areas, will create a much better sense of spaciousness and a more enjoyable, stress-free experience for staff. It’s surprising how much a good clear out can create more space. It’s understandable that in a busy office, clutter will gather up over time and make an area look crowded and untidy. A clear desk reflects a clear mind and getting rid of clutter will create a more open and clean environment while helping staff to focus more and stay motivated. If you’re truly struggling to create the space you need in the office and you don’t have enough time to commit yourself fully to the project, hiring an interior designer or professional organiser can be an ideal solution that will fix your problem while allowing you to still focus on work. 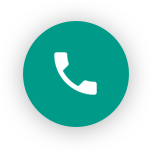 Reach out and give us a call with regards to helping you create something for you and your business space. The workspace revolution is all about design. The future is all about creating productive environments using agile and flexible designs. The old ways are being cast aside as companies and organisations focus on work and its settings holistically. The demand for new approaches is at an all time high. Below, the team here at London Wall looks into the future of our offices. The world over, companies are seeking ways to facilitate a more harmonious environment for collaboration, team shifting, and flexibility within the work place. An office space can become more effective, flexible and efficient because it supports a dynamic rather than a static workforce. As the attitude towards the environment in which work changes, so too will its aesthetic. The line between work and home will blur as companies focus on the idea of community. Coworking space, with its informal and collaborative ethos, will scale up. Smart environments will become the norm. Attracting this young, forward-thinking and creative generation will be a shared goal of cities and employers. Transformative Spaces - leading organisations understand that well-designed workspaces improve performance and encourage productivity. They see it as crucial to achieving their goals. The shift towards transformational spaces is proof that the emphasis is being placed upon building a positive dynamic through effective office space design. Allowing individuals and groups to control their surroundings enables the space to come alive and become activated by people. Every space should be curated according to the culture while at the same time ensuring a free-flowing atmosphere with a variety of work mode options. By changing the design and feel of your work space and allowing it to become more flexible, you will in turn change and adapt the attitude, productivity and harmony of the your workforce. more product launches than you can imagine. including talks, workshops and product launches. their doors to the visitors hosting workshops, displays and installations. craftsmanship, cultural heritage, diversity, innovation and design talent. Next CDW takes place from 22-24 May 18 in London. CDW17 1st appearance a success! Last week was a very exciting, new experience for all at London Wall Design. Our first appearance at CDW17 in our new showroom based in Turnmill Street. Our showroom partners - Assmann Office Furniture were kind enough to show us the ropes! We would like to thank all our clients who took the time to drop in and say hello. A warm welcome to those who we met for the first time and we look forward to working with you on your projects in the future. The showroom is open Monday to Friday, from 9am to 5pm. It is London Wall's first appearance at Clerkenwell Design Week - 23-25 May 2017, introducing their movable wall designs to the Clerkenwell audience. We are on show throughout the week at the Assmann Showroom, 75 A Turnmill Street, London, EC1M 5SY, UK. As business evolves and requirements change in our fast-paced world, London Wall Design continue to bring ground breaking, intuitive products to the industry and pride ourselves in being able to create unique and bespoke systems for all our clients, whatever the application. Our latest project which has been installed and tested has made us particularly proud and set a new standard in acoustic movable walls. London Wall Design and Movawall Systems have successfully achieved our CHAS certificate of accreditation for the 10th consecutive year running. Well done and thanks to Ron Gray!